An innovative digital library now allows Romanian metro commuters to pass their time with a good book. 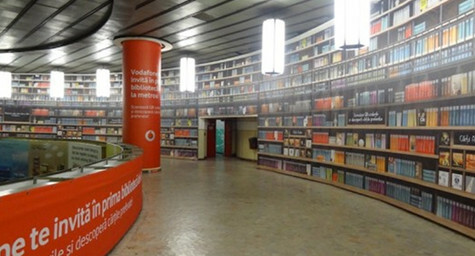 This unique advertising campaign, a collaboration between Vodaphone Romania and publisher, Humanitas, enables commuters to download volumes directly from a digital library in a Bucharest subway station. The brightest idea comes here: you can use your smartphone to scan QR codes visible on the spines of the books – to actually start reading a book in no time. It’s part of a larger effort to encourage reading among young Romanians, since general readership has declined throughout the country in recent years, with a reported 52 percent of Romanians claiming to never read books. It’s hoped that the Vodaphone Digital Library can leverage the younger audience’s interest in the Internet and inspire them to discover the delight of digital books. eBookFriendly.com posted the following pictures of this progressive project. Implement a creative out-of-home digital marketing campaign to capture your audience’s attention. Contact MDG Advertising. MDG Advertising, a full-service advertising agency with offices in Boca Raton and New York City, is one of Florida’s top integrated marketing agencies. Our 360° integrated marketing strategies use just the right mix of digital and traditional advertising to reach your goals. While some industries may fare better in print and others online, we strive to create a balanced approach, where traditional, social media, and digital marketing efforts support each other and your message is tailored to the medium. To learn more about the latest trends in marketing and advertising, contact MDG Advertising.